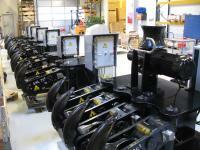 Tamar Marine Engineering Ltd is a global leader in the design and manufacture and commissioning of marine fenders. Marine fenders are a vital element of any commercial marine facility and provide the necessary protection between vessels and the Quay structure itself. 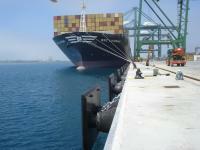 Our marine fenders are utilized by numerous of ports and harbours though out the world. These facilities are supported by TME via the engineering consultants and contractors that design, construct and maintain the docks and quays. Our product line includes numerous types of marine fenders for various applications, including: cone fenders, cell fenders, leg/element fenders, arch type fenders and pneumatic fenders. All of our marine fenders are tested to the most rigorous standards per the latest international requirements, and TME leads the way in providing honest, practical and proven solutions for our clients. Working closely with our partners Tamar Marine Engineering specialize in the design, manufacture, sale, service and maintenance of Mooring and Berthing Systems for bulk, oil & gas terminals and also many offshore applications. Tamar Marine Engineering's core products include Quick Release Hooks, Mooring Load Monitoring Systems, Laser Docking Systems, Environmental Monitoring Systems, Portable GPS Positioning Systems and Software Integrations/Standardizations, which we use for upgrades of existing control systems provided by other vendor. All our systems contribute to increased safety and efficiency in ports and offshore environments. Tamar Marine Engineering Limited offers "peace of mind" to the operators of on and offshore terminals handling crude oil and refined products, through a comprehensive range of independent specialist marine Fender support services designed to optimize the use of your OCIMF marine Fender assets without compromising on safety, the environment or the availability of your marine terminal. We introduce the Marine Fender Integrity Management System (MFIMS). Our team of consultants, some of which have considerable experience, specialize in marine Fender design, system analysis, field engineering, trouble-shooting and failure investigations. Marine Fenders are a critical link in your import / export channel. Running to destruction is not an option. Integrity Management through OCIMF and BS compliance and impartial support are key to safely optimizing your marine Fender assets. Please review the many benefits of procuring a service agreement with us.